Vintage Fifties Spadea sewing pattern by Harvey Berin. 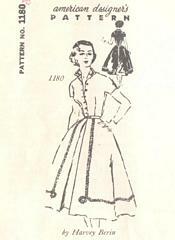 Shirtwaist style dress has full skirt and inverted center front pleat with underlay. Short kimono sleeves with underarm gussets. Front bodice button closure. Self fabric belt. Pattern is unused, complete and in original factory folds. Not dated. Circa mid 1950's.